I gave up Facebook, again. Anyone who has read my blog over the last couple of years knows that I have one of those personalities that struggles with temperance when it comes to Facebook. I like to read the news, watch the Church, and engage in discussions with people. What I have discovered over the course of the last few years is that most FB conversations are not discussion, they turn into fights that typically end with ad hominem attacks. For whatever strange reason, I get sucked in. Facebook is not a bad thing. In fact, it can be used for great good. It has allowed people to stay connected well past the relationships of previous ages. We can stay informed in real-time and share a bit of ourselves on our tiny slice of the Internet. For someone who tends towards introvert in social settings, it is an opportunity to express myself without all of the awkwardness of idle small talk. It is also a great place to share writing projects, get feedback, and have people share your work. I am very thankful to the people who have shared my writing over the years. I want to be honest, though, in the hope that my weakness will help others. I have allowed my iPhone and Facebook to take over my life. I have forgotten how to sit in stillness. I cannot even seem to sit for five minutes in the car without my phone when my husband runs in the store. At night, my husband sits and watches TV, I am on my phone or laptop, and our daughter is either vying for our attention or on her tablet that we got her for school use. I have become one of those mindless drones. I have forgotten how to live in the present. I am ashamed admit this out loud. The only other people who are aware of it are my regular Confessor and my family. I am sure people have guessed who are friends with me on FB. They see my frequent posts and know that I have been sucked in. That I have chosen to use the distraction of Facebook to try to quiet the restlessness in my own heart. It became my go-to “distractor” (as my husband calls it) after my miscarriages and when the post-partum depression/anxiety was so bad. It became a way for me to engage in adult conversation when my husband was traveling for work. It started off as simply a way to connect, but then I allowed it to consume me. I have seen people argue that we should not leave Facebook because we have an obligation to evangelize. I disagree. Perhaps God is calling me to evangelize in a different medium than social media? If I cannot use it in a temperate manner and I allow it to take time away from my family and my life, then it is no longer a good in my life. I convinced myself that I needed it to be a writer. If I was going to get my work out there and find writing gigs then I need a social media presence. That is a lie. I am already a regular contributor for one of the largest Catholic websites available and the other sites that interest me are only looking for submissions, not my blog presence. I do not need Facebook to be a Catholic writer. I am already a Catholic writer. How many of us struggle with our isolation or loneliness through an overabundance of social media? I suspect it in a few of my former Facebook friends who like me struggle with living in that moment. Mine stems from periods of existential dread and a battle with sloth. I realized the answer to my struggles in two very different experiences. Yesterday was the Feast of the Holy Archangels. It is a huge feast day in our home because our daughter is named after St. Michael. I went out of my way to make it a special celebration. We made cookies, cards to deliver to Catholic friends, and I made a nice traditional dinner. I was living the rhythms of the Church and sharing it with my daughter. I felt the most profound joy and peace. It reminded me of what kind of life I want to live and how I want to lead my daughter. Today is the exact opposite. I woke up tired from my hormone issues and didn’t want to accomplish much. I spent the morning on my laptop while my daughter played and watched PBS. We did about an hour of school with her practicing her writing. I am a bit of a zombie today. I then got into an argument with someone on Facebook in which we were probably both a little right and then I got irritated with my daughter. After that moment I could see clearly, once again, what I was doing. I was wasting my time arguing with someone whom I do not even know in person. Yes, a fellow brother in Christ, but he was not the flesh and blood daughter standing in front of me. Our culture tells us social media is wonderful and that it is okay to be on it all of the time. To be clear, I am not condemning social media. I am cautioning against its overuse, especially in the face of loneliness. It quickly becomes the way we see the world. 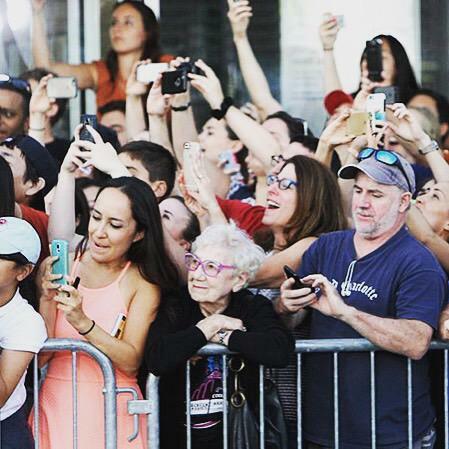 We are constantly looking at our phones or computers instead of the people around us. There are plenty of people who use social media in a healthy manner, at this point I am just not one of those people. So this is me being honest. I am addicted to Facebook and I just gave it up again. This time I pray for the long run. I have gone months and months without it, but then I get back into it for whatever reason. This time I want to focus on the gifts of my husband and daughter and see where God leads me. I want to quiet that restlessness through the stillness of God. Giving up Facebook means that I can devote time to my family, studies, and write the books I want to write. So I am walking away from it. God bless. You are exactly right. Prayer is our best weapon. Unfortunately it tends to slip when other distractions are readily available. I know this is a constant struggle in my case. Thank you for reading. I will have to read your blog post from yesterday. Pax. I saw this picture earlier this week (on Facebook ironically). It really struck a chord. I’ve literally just deleted 90% of my friends and it feels awesome. I’ve made a commitment to not pick up my phone before midday, and not at all on Sunday. So far, I’m feeling a lot more relaxed! Isn’t it an amazing photo?! I think I saw it on Facebook also. I understand what you mean about feeling awesome after changing things up on Facebook. I had the most amazing sense of freedom when I hit deactivate. I pray your purge of Facebook friends continues to bring more peace. I have done the same thing in the past. I had a firm rule that if the person was a near occasion of sin for me I deleted them. It was more for my sake. Less for me to Confess….LOL. Thank you for sharing. Pax. Thank you for being so honest. I, as a writer working at home, struggle with Facebook again and again and again. Several times in the past, I disconnected for some weeks or some months, mostly after confession. Then, for a sincere reason (e.g. the wedding of my daughter and shared pictures about the ceremony) I have ‘just a short peek’ on Facebook and there we go again: addicted! Facebook discussions, mostly with fellow catholics with just another view of mine, exhaust me and I feel depressed afterwards. It seems I can’t find the balance. To have no Facebook at all means loosing connection with friends and family I’m afraid. Working on your own, no husband, can be lonely. Thanks for checking in. I found Facebook to be an impediment on *my* path to holiness, so I cut it out…so to speak. My husband is ecstatic and truth be told, I have better focus now that it is not a distraction. I am on Twitter, but I don’t particularly like it. I use it to read a few things and share a few items, but it’s not something I use a lot. I hope you and your family are doing well. God bless.